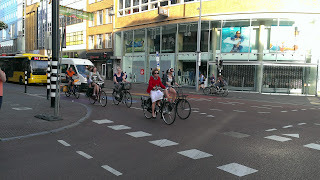 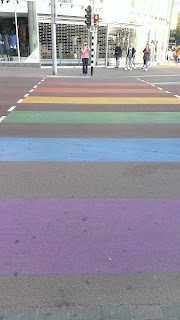 A visit to Utrecht provided a pleasant surpise in the form of color on the street at a crosswalk. 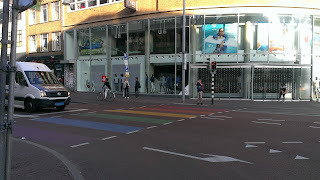 In addition to the rainbow crosswalk, there is a diagonal crossing for a movement for people using bicycles. 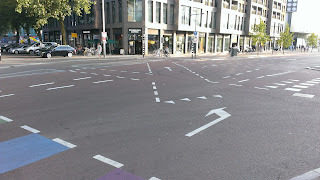 This diagonal crossing provides an opportunity to eliminate what would be a two stage crossing in Denmark or most other cases. It takes advantage of the fact that there is a long time necessary for pedestrian crossing perpendicular to this through bike movement.